The Saudi-led, US-backed assault on Yemen, now entering its sixth month, continues to take a devastating toll on the country’s civilian population. At least 36 workers were reported killed Sunday after a Saudi-led coalition jet fighter bombed a water -bottling factory in the Abs District of Hajjah Governorate. Local residents said that dozens of workers had been killed and reported pulling charred remains from the rubble of the plant. “The process of recovering the bodies is finished now. The corpses of 36 workers, many of them burnt or in pieces, were pulled out after an air strike hit the plant this morning,” Hajjah resident Issah Ahmed told Reuters in a phone interview. This bloody war crime was the latest in a string of airstrikes that have resulted in mass civilian casualties in the Saudi-spearheaded war against the Houthi militias and allied forces. A bombing raid on a dairy and juicing factory in the western port city of Hodeida in April killed at least 37 workers and injured 80 others. Since the anti-Houthi offensive began in March, more than 4,300 have been killed, at least half of them civilians. Residential neighborhoods, factories, ports, schools, hospitals and markets have all been the targets of Saudi-led bombing raids as the coalition, fully backed by the US government, seeks to bring President Abd Rabbuh Monsour Hadi back to power. Amnesty International released a report last month which documented potential “war crimes, by all parties,” including coalition bombing raids on a school being used as a shelter, a food market and a workers’ dormitory. With the support of military forces loyal to former dictator Ali Abduallah Saleh, the Houthi militias consolidated control over much of Yemen’s western provinces in March, including the southern port city of Aden. They forced Hadi to flee the country for Saudi Arabia, where he established a government-in-exile. The Saudis have charged that Iran is backing the Houthis, though Iran has denied providing military equipment. 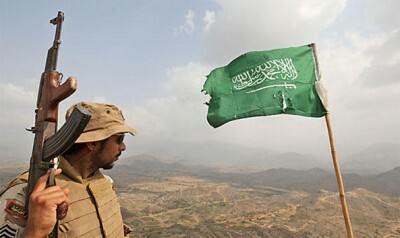 The Saudi-backed Asharq Al Awsat reported on Monday that Saudi-led ground forces have initiated the third prong of the ground invasion, moving troops into Saada province. The troops have entrenched in tribal areas outside of the city of Saada, while Saudi planes have been dropping leaflets encouraging residents to support the reinstatement of the Hadi government. More than a million people have been displaced by the fighting. Approximately 21 million people, or 80 percent of the total population, lack access to clean drinking water and are in need of some additional form of humanitarian aid. International charity Save the Children warned on Sunday that Al Sabeen Hospital, the main women and children’s hospital in Sanaa, is faced with imminent closure due to a shortage of medical supplies and fuel for power generators. The hospital has already run out of IV fluid and ready-made food for malnourished children. Since the Saudi-led assault began earlier this year, the number of people in Yemen who lack access to basic health care has increased by 40 percent to 15.2 million. The number of children admitted to Yemeni hospitals for malnutrition since March has skyrocketed by 150 percent. It is estimated that more than half a million children will suffer from severe acute malnutrition by the end of the year.